Did you know that your bedroom can have a big impact on the quality of your sleep? It’s true! From how hot or cool it is, to your light sources, to where you put your electronics; it can all be affecting how well-rested you feel each morning! 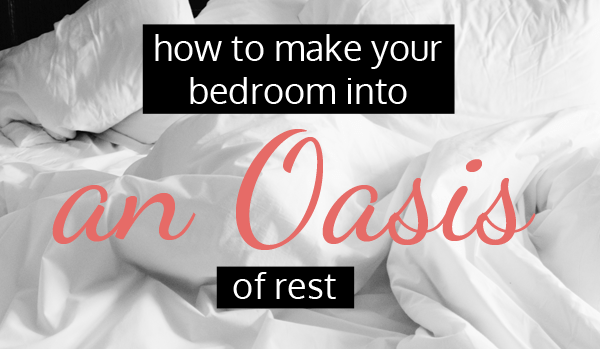 Whether you’re looking to wake up feeling more alert, or simply want to turn your bedroom into a retreat for relaxation and sleep, these tips will help you make the most of your bedroom and turn it into a calming, welcoming oasis which is perfect for getting a good night’s rest! Did you know that those mornings when you wake up covered in sweat are actually indicative that you didn’t sleep well? You’re not crazy! In fact, being in a warm or too-hot room can drastically affect the quality of your sleep. In fact, the optimal temperature for the best rest is 15 to 22 degrees Celsius. If you’re not comfortable with leaving your AC on all the time, invest in a can (ceiling fans are great for this, but a regular standing or desktop fan works well, too), or even open the windows a little to let some cool air in. Your internal clock is based on light signale which are fed to your brain through your eye’s optic nerves. When light is detected, even when you have your eyes closed, it can delay the melatonin release which brings sleep, so always turn off the lights when you’re ready for sleep. If you have to keep your phone or electronics in your bedroom, keep them as far away from your bad as possible and keep them face-down. Studies have shown that exposure to electrical light before and during sleep suppresses melatonin, meaning that your phone could be disrupting your sleep cycle and making you tired! If your windows let light in, or you tend to sleep in past sunrise, investing in heavy shades and light-obscuring blinds can also make a world of difference. Is blocking light just not feasible? Consider buying a sleeping mask. No longer for glamour-pusses and old ladies, they come in a variety of cute styles with comfy strings or elastics to help you sleep better. Noises and disturbances can affect the quality of your sleep, so if you live in an environment which is particularly loud – maybe you live near or on a busy street, or your partner snores like crazy – investing in some earplugs can go a long way towards a restful night’s sleep. If earplugs are uncomfortable or bothersome, you can also try investing in a white noise machine, or wave machine which can block out other, more unpleasant, sounds. It may feel relaxing to lounge around in bed and watch Netflix, research has shown that watching TV can negatively impact your sleep. The motion, sound, and light from the TV all keep your mind stimulated, and in particular the light from the TV affects your internal clock, making it harder to fall asleep and to have the kind of sound sleep you need to feel rested and productive. Additionally, research has shown that small kids and infants can experience sleep problems, such as resisting going to bed and increased anxiety, when exposed to TV right before sleep. It’s not necessary to get the highest thread count available, but it is important to select bedding which feels nice against your skin, and doesn’t distract you while you’re lying in bed. For those of us on the prairies, and in other places where we experience the full range of seasons, having separate sets of bedding for both winter and summer can go a long way to keeping you comfortable at night. We spend 1/3 of our lives asleep, so it makes sense to be as comfortable as possible! Most people keep their mattresses for around 10 years, but the Better Sleep Council suggests that you begin looking for a new mattress every 5-7 years. However, if your mattress is showing signs of wear and tear such as deep impressions, or is causing you pain to sleep on it, it’s time to look at getting a replacement. Additionally, if you’ve recently been having physical issues, are recovering from an injury, or experience chronic pain, speak to your doctor about the right kind of mattress to suit your needs. Pillows should be replaced every 1-2 years, especially in the case of down or poly-filled pillows, which can lose their shape more easily. If a pillow is too flat, or too thick, it’s time to purchase a new one. Also, don’t forget to regularly wash your pillowcases! While it’s important to regularly wash your bed linens, our pillowcases quickly pick up and trap all the grease, bacteria, dead skin, and other unpleasantness from our faces while we sleep and rub our hair and faces on it. Want more tips on how to make your home a comfortable and welcoming place to be? Sign up for our newsletter! Get a Life! Take Time to Live Well by Hiring a Handyman and Cleaning Service. We had to face it. With two full time jobs, 2 children, a puppy (why do they seem like they can be more work than kids), and my extremely demanding career, we had a growing to-do list and just not enough time. Our house was a mess and falling apart. We never could quite manage to wash the dishes, make the beds, clean the bathroom or vacuum, and have a few minutes of free time for ourselves. There were things which needed cleaning or fixing that we kept pushing off. Often, we’d settle for superficial cleaning just to get some peace of mind and time to wind down and take a breath. We’d worry about leaks every time it rained and water spewed off one of the broken gutters, but, honestly, neither of us had the heart nor the energy to tackle the problems at hand. All that changed one day as a good friend of ours stopped by on her way back home from grocery shopping for a quick chat and a coffee. It was 2 p.m., I was still wearing my pyjama bottoms and Josh had decidedly suspicious brown stains speckled all over the front of his shirt. My hair was a mess and I hadn’t taken a shower in two days. My friend took one look at us, at the house, and, BLESS HER, said nothing. It spurred me, though, and I decided to hire the help of a Winnipeg-based handyman and cleaning service. There are two reasons why we both feel this was worth our money. One, hooking up with handyman and cleaning service in Winnipeg helped free-up our time. We were better rested and felt on top of things. I managed to find the time to immerse myself in my hobbies a few times a week. We both played with our girls and Josh taught our puppy, Casper, some new tricks. In return, he has given up chewing on our cushions. Two, booking weekly time with a handyman and cleaning service in Winnipeg has actually allowed us to save money. That’s right. We were better rested. Josh booked some new clients at work and I was much more productive with my career. Also, making repairs quickly almost always costs less than waiting until they become bigger problems. For example, untreated wood rots, leaking faucets raise your water bill, un-caulked doors and windows waste energy, etc. Our handyman fixed our gutters in no time and also initiated a few other home improvement projects we can be proud of. If you’re like us, you enjoy your home more when it is in tip-top shape. So what are you waiting for? Stop feeling guilty. Employ the help of a handyman and cleaning service in Winnipeg and invest in yourself and your home today. Find out more about Take Time’s handyman services here.